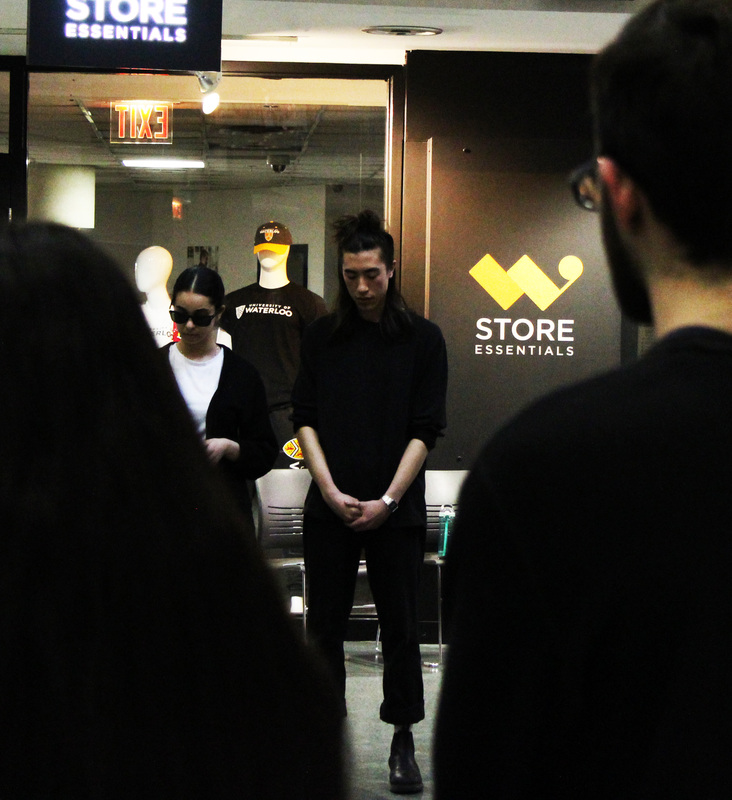 Ethan Candler participates in a moment of silence for the victims of New Zealand mosque shooting. As her son left for Friday prayer at the mosque, Rania Lawendy, Muslim Chaplain at UW, wondered how many Muslim children in New Zealand had said goodbye to their mothers the morning of Mar. 15, and then never came back. The Racial Advocacy for Inclusion, Solidarity, and Equity (RAISE) held a vigil in the Lower Atrium of the Student Life Centre on Mar. 15 for the victims of the New Zealand shooting half a day prior. They lit 49 candles in honour of the 49 people that lost their lives to the terrorism of a white supremacist. On the morning of Mar. 15, Brenton Harrison Tarrant targeted two mosques in Christchurch, New Zealand. He entered the mosques and opened fire on the Islamic faithful attending their Friday prayers. “[The first man to greet him in the mosque] said to him, ‘Salam, Brother,’ and still, he shot,” Lawendy said. Hanan Thibeh, co-coordinator of RAISE, reminded students that RAISE is open every weekday from 10 a.m. to 5 p.m, offers peer support, and work toward making safe spaces for students of colour. Fiqir Worku, also a co-coordinator at RAISE, said although New Zealand is far away, the issues of racism and Islamophobia are not. “These Islamophobic, far right sentiments are everywhere. So I think by focusing on creating an environment where we’re making a stand saying that this is not accepted here, by holding events, by holding peer-support hours and promoting peer-support hours for these communities that are affected by this tragedy, definitely goes a longer way than some people think. It’s not far away, it’s not something that’s just isolated to New Zealand. It happens in Canada, we’ve seen it,” she said. Ethan Candler, Advocacy Director for RAISE, stated that it is important to remember the privilege that Canadians hold, one that is still maintained at the price of some marginalized groups. Sheila, whose name has been changed, was an attendee of the vigil. She said in tough times, it is necessary to maintain positivity and reach out for supports in the community. Many of the speakers and attendees present at the vigil agreed that unity in the community is important to help individuals deal with this difficult news. “We have to remember: it’s not a Muslim community thing, we’re all one community. And when one of us is killed, all of us are killed and when one of us is harmed, all of us are harmed,” Lawendy said. There have been charities and crowdfunding initiatives organized in order to help the families and communities affected by this tragedy. New Zealand Council of Victim Support Groups, the Jewish Federation of Greater Pittsburgh, and Muslim crowdfunding site, Launchgood. For peer and community support to to join in the fight aginst racism, contact RAISE at uwraise@gmail.com, or Rania Lawendy at rania@abisol.com.